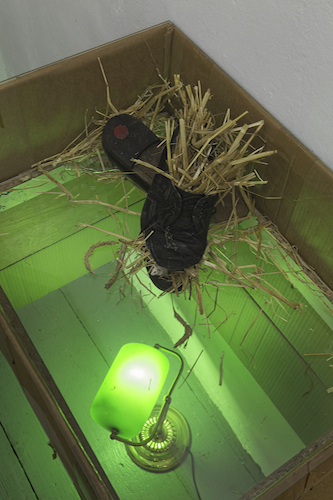 Lukas Quietzsch, Private Society, 2015, cardboard, glass, lamp, shoes, straw, plastic, 41 x 18 x 26". Lukas Quietzsch’s first-ever solo show has many components: a hand-built vitrine, nine paintings, a cell-phone number printed on the exhibition invite, a puzzling press text written in collaboration with artist Philipp Simon, and a provocative title—“You Are a Pig.” Dialing the phone number, you reach a message by street performer Matthew Silver, whose proposal that “love is the answer” must necessarily be doubted. One key issue can be identified across these different media: The artist is questioning neoliberal recipes for success and the increasing demand to decide between yes and no, right and wrong, without any alternative. The first piece is the vitrine Private Society (all works 2015), built from cardboard and glass and filled with a dirty pair of old shoes and straw, welcoming the viewer with a hint of farmyard smell. The green light of a banker’s lamp illuminates the piece, transforming it into a commodity ready for speculation. The motifs of the gouache-on-canvas paintings are derived and blown up from different genres of drawing. For instance, in Government District, Quietzsch has staged talking heads in front of a red background after a drawing by a criminal court artist. The starting point for To (Want to) Break Away from Immense Entanglements by Clumsy Means was a doodle by a prisoner. It features words like “love” and “hate,” as well as a scribble depicting two eyes on a cold yellow backdrop. Due to the treatment of these canvases during production—a kind of frottage and washing of the support material—the imagery looks pale and broken by the paintings’ closely meshed net surface pattern, due to the frottage, giving them a subtle, computed style.